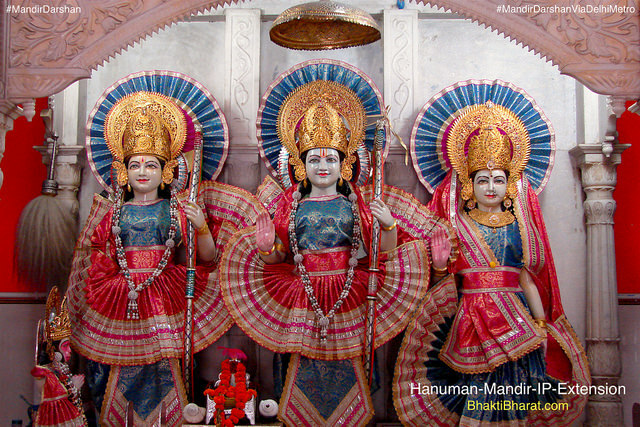 प्राचीन श्री हनुमान मंदिर (Prachin Shri Hanuman Mandir) is the oldest Hanuman Lala temple of East Delhi. Shri Hanumant murti appeared after a heavy flood in holy river Yamuna around 1970s. Regular bhandare are offered by temple on monthly basis for last Tuesday and Saturday. Temple is also famous for bhajan & kirtan on every Shukla Ekadashi with blesses of Shri Shyam Baba. Oldest Shri Hanuman Mandir in East Delhi. Bhandara on Last Tuesday and Saturday of Every Month. Shri Shyam Baba Bhajan on Every Shukla Ekadashi. Decorative wall nakkashi with Sanjivani dharan Shri Hanuman with shades of peepal tree. On front left corner, Baba Shri Shyam Darbar decorated with beautiful blue, yellow and white flowers. A complete front view with all three shikhar, pic taken from opposite road side. Front Shri Ram Darbar having Prabhu Shri Ramchandra, Mata Janki, Bhai Shri Lakshma and Rambhakt Shri Hanumant Lal.